Item # 306299 Stash Points: 1,495 (?) This is the number of points you get in The Zumiez Stash for purchasing this item. Stash points are redeemable for exclusive rewards only available to Zumiez Stash members. To redeem your points check out the rewards catalog on thestash.zumiez.com. 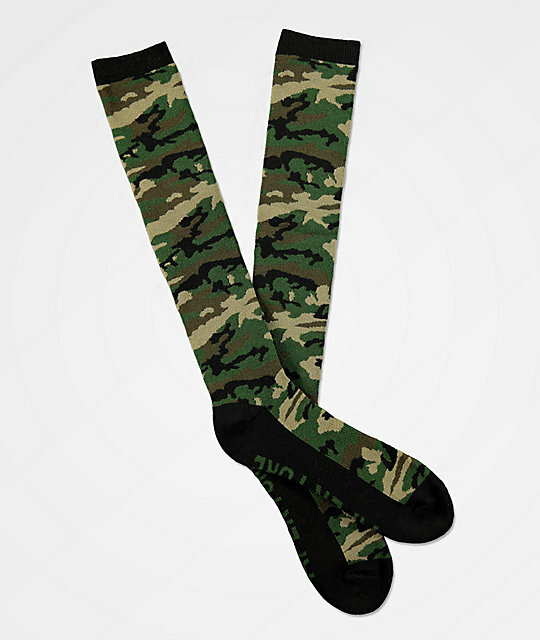 Stay comfortable all season long with Aperture's Dowdy Camo Snowboard Socks. These camouflaged socks offer a very plush fit and feel that are complete with ribbed arch bands, ribbed upper cuffs and an overall padded construction for unparalleled comfort. Dowdy Camo Snowboard Socks from Aperture. Colorblock construction in black and green, brown and tan camouflage. Jacquard knit logo script along footbeds. Seamless toe box for durability and chafe-free comfort. Ribbed arch bands for ample support and prevents sagging/bunching. Padded footbed, heel, top of foot and shin for impact protection. 84% cotton, 14% polyester, 1% spandex.